Our professional fitness instructors are on hand to provide programming, advice and motivation. We pride ourselves on the high quality of our staff and our commitment to improving your lifestyle. Book an appointment now and see the difference one of our professional fitness instructors can make to your ambitions! 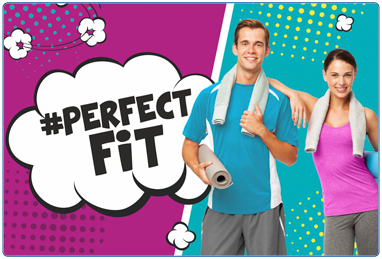 You can book your Perfect Fit online, or alternatively contact your local leisure centre for further information. Our five step personal plan ensures you get the best start in achieving your fitness goals. Bonus: Free prize - to reward your efforts for completing five sessions you'll receive a free gift. Limited offer - while stocks last! This is your essential starting point for your fitness journey. We'll discuss your goals and exercise experiences to create the most flexible fitness plan for you, whether you're an absolute beginner or a seasoned trainer. You are unique and so is your exercise plan. These sessions help to fine tune your programme and lets you tell your fitness instructor how you're getting on. We'll give you tips and advice on how best to succeed at reaching your goals. Nutritional Consultation - You like food? We like to talk about food. Together we can make your diet fit your aspirations, not derail them. Health Consultation - How healthy are you? We can give you a quick snapshot of your health, using BMI, Body Fat %, Lung strength, Grip strength and more, including healthy lifestyle advice. Advanced Programming - Want something a little more exotic to push your body? Our fitness instructors can tailor advanced programs to suit all needs. Goal Monitoring - We can track and evaluate your goals. Whether they are based on weight loss or something as advanced as marathon training, our enthusiastic fitness instructors will help you stick to your plan. Your journey doesn't stop there. We're here to offer continual support and advice, without any additional expense. * The Perfect Fit continues on for you with our qualified instructors there for every step of your fitness journey. If you are 12-15 years old we will provide you with five supervised coaching sessions that will develop your knowledge to make sure you have the skills and know-how to use our staffed gyms without further direct supervision. Under 14's will require parental / guardian supervision during unstaffed opening hours.